I will certainly admit there are things I may be wrong about. I am not an economist. I am an investor by background. Despite my cynicism the economists are all really bright guys and have put a lot of thought into the issues. What I can say with absolute certainty is that I have lost a lot of faith and trust in the system. And I am not the only one. This sentiment is running at all-time highs amongst business leaders (their collective in-actions prove it) and guys on the street. It is both sides of the barbell and middle that are upset. Often it’s one or the other, but not all three. This time it’s not at an external state, it’s directed inwards. That is a tough problem to solve. Jingoism is not the answer either as we already tried that. If any of my commentary is wrong in fact, it is not wrong in principle. I am exhibit A when it comes to lost faith, and as I said this sentiment is not unique to me. If there is no faith in the system, it has a really hard time working. And I mean real underlying faith and trust in the system, as opposed to the confidence born from economic steroid injections or entitlements. These are valid notions, but as a point of clarity I am talking about a something different. There also is a subtle but important distinction between faith and trust versus confidence. Faith and trust are longer term and more powerful concepts. For example, common wisdom tells us it was all the government spending in World War II that got things turned around. This notion is far from factual, and any argument that portrays it as such should be taken with a grain of salt. And it is insufficient as the primary evidence for policy decisions. There is a big difference between coincident and causal. How did all the war related spending work out for the Axis powers? The Soviet Union? Truth is nobody really knows what got the flywheel spinning in the right and sustainable direction for the U.S. after WWII. I believe all the WWII government spending would have been meaningless without people finally feeling really good for obvious reasons when the Allied powers won the war, after about 20 years of misery post the great depression. And the system cleansed for a long time prior to this all happening. There were pre- and post-conditions in place for a rebound then that are not in place now. A happy and invigorated population is very powerful for any economy. Oftentimes it’s impossible to know what is the chicken and what is the egg, government investment catalyzing corporate and consumer spend or a rare positive exogenous event resulting in a suddenly happy consumer pulling investment through the system, or if neither can occur without the other and with sound economic policy in place at the same time as well. And even if the spending was the final lynchpin then, it does not mean the economy and the nature of risk aversion today is of the same nature. That is what the collective inaction of business leaders with their muted response to policy for many years is telling us. There is more going on than a temporary lull in animal spirits that current fiscal and monetary policy will cure. If that was the case, it would be working already. It may be I have focused too much domestically, as this notion of belief could now extend globally, and the economy is also much more global now than at any point in the past. By extension business leaders think of countries like they do customers. No CEO would rely on customers or suppliers with the balance sheets a lot of countries have. In the back of their minds they must be wondering how exactly this all hangs together (as do many individuals who read the Wall Street Journal and have a ton of money in cash). Now, something has to happen to restore our collective faith. And more short term fixes and empty promises during campaign speeches and the State of the Union addresses are not what do it. It may start with a new leader (Democrat or Republican) after the next election. Or it may just start under current leadership with something as simple as people feeling the system is running well again. Or maybe the Fed starts showing more restraint and markets become markets again. It may be the notion that issues in other countries around the globe start to resolve. Or it just may be time. It is impossible to know, but I hope faith is restored and that the American spirit ultimately prevails over the impediments in place. At any rate, on to the details. I pulled together the following chart to illustrate the historical relationship between corporate profits (red) and employed Americans (blue). As you can see it began to diverge in the ~2003 and ~2009 corporate profit cycles, when corporate profits started to fare much better than the number of working Americans. 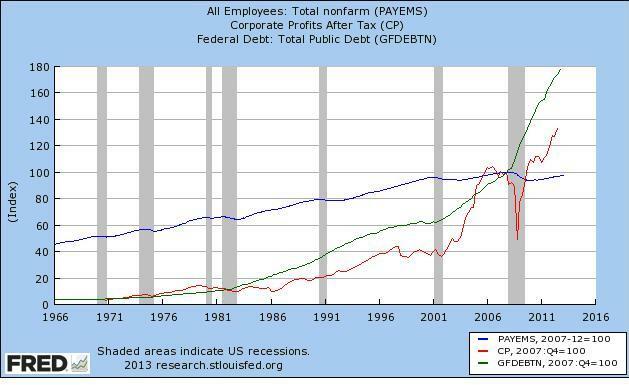 I also included total public debt (green). Here is my thinking about what has happened and some other related points. Think about it from the perspective of a CEO. First some interesting facts which if one had a-priori, one would probably not think there would be an explosion in corporate profits under these conditions: When the stock market was at this price in 2007: Consumer Confidence: then 99.5, now 69.6; Americans on Food Stamps: then 26.9 million, now 47.69 million. Also real median annual household income (using what is an understated CPI in my opinion) in January of 2013 was $51,584 – or 92.7% of the level in January 2000 and it remains well below the $54,008 level seen at the start of the recovery in ~2009. But at the same time counter-intuitively corporate earnings and margins have skyrocketed to a new peak which is the primary reason the equity market has rallied. Despite all the chatter about QE driving the stock market up, from the move off the bottom most of it has to have been profit driven (profit margins being un-natural and funded by the government which I will explain next), whether profits account for 70% or 90% or 99% of the move I cannot tell you although I have some guesses. Profits are the question at hand. The chart shows corporate profits have generally tracked employed Americans. Makes sense. Jobs = income = consumer spend = corporate revenue =profits. Fewer jobs = less revenue = less profits. Economics 101. Starting with the ~2009 cycle first. In the 2008 downturn companies eliminated a lot of jobs. The depth of the downturn forced them to make the tough decision. Normally that kills consumer spend due to wage loss. But the government plugged the revenue gap with transfer payments and direct investment. See the green line go nearly vertical and it is fascinating how profit growth has mirrored the trajectory of debt growth. The consumer has started to dis-save again as well. Thus corporations kept the revenue, lost the labor, and voila record margins. You could argue unemployment is being subsidized. Like anything else, when something is subsidized, you tend to get a lot of it. Normally corporates would take the excess profits and re-invest in capacity and labor, driving margins back down to mean levels or even into an excess capacity situation (normal business cycle). Certainly at this level of profits the return on investing idle cash in capacity (capital and labor) should be much higher than having it accumulate and earn 0% interest. When businesses invest and hire to take share because share and growth is profitable, that competition pushes profits to consumers (wage earners) through higher employment, higher wages and lower real prices. Competition and risk-taking often hurt investors over the short term. It’s risky and sometimes unprofitable or profit margin lowering, but is great for the economy over the long term. The economy needs risk taking and competition to grow and sustain itself. But now there is greatly subdued competition because CEOs are scared to take risk. Investments in capital and labor are long lived and expensive if wrong (even labor as there is a high frictional cost of firing employees). Other forms of regulation and things like Obamacare and lack of faith in the government lead to further risk aversion by employers. Thus low growth, but high profits. Investors for the time being seem to love this condition, especially when it is hard to find yield elsewhere. Now high profits are discounted with low interest rates because nobody sees any growth. They start extending the time horizon over which they are willing to discount high profits with low discount rates. Or more simply we end up with record margins, high profits, low growth, underemployment, and high stock prices. Today corporate profits are near 11% of GDP, and G is a bigger hunk as well, so flow that math through and think of the implications. With respect to Mr. Buffett’s point about competition, I previously stated my view on what has happened to competition (and more on this topic to follow). And if competition goes away forever and margins hold here, a condition I don’t think possible, that is just terrible for the US economy. You might as well run to the hills for good. And I am not sure exactly what Mr. Buffett means with his public policy point, better to ask him. I suspect it’s about unacceptable income distribution and poverty and lack of revenue generating real consumer income. I guess that is why he uses corporate profits as a % of GDP as opposed to margins relative to their own history which is simpler. Mr. Buffett is right that this problem seems to be politically unacceptable, but it is now being dealt with and financed in a way he must not have thought possible or sensible. Debt financed direct or indirect transfer payments cannot sustain at this rate without negative consequences. But clearly, Mr. Buffett has changed his mind. I doubt he would make the simplistic rates are low and don’t fight the Fed argument, he never seems to have been that guy (in the past which I reference in the next section he has said roughly the opposite). It may be he is worried about excess inflation and views equities as the best inflation hedge he can find, especially the ones he is buying, but hasn’t said that for obvious reasons. I hate to think that could be the case at current margins and multiples, but I am scared that it may be. And there is no doubt he is a better investor than I ever was, the scoreboard is the scoreboard. However, a rise in equities solely due to inflation is not a rise to be celebrated, nor does it produce real wealth. History shows equities lose value in real terms in periods of high inflation. And if one is bullish on equities for inflationary reasons, one really is bearish on the economy because real wealth and income is being destroyed. Be careful what you ask for because you might get it. But maybe as investors thought the internet was creating a new equity valuation paradigm in 1999 when he offered this quote (and he was not young and unwise then), investors are now thinking continual government borrowing and intervention and ZIRP are creating a new investment paradigm in this day and age, and that profit margins will never mean revert as they always have, nor will any other bad things happen? I wonder what S&P EPS would be if the G component of GDP was back to normalized levels (which still seems to mean running a deficit) which would lead to less revenue, and margins were closer to normalized levels as well? My guess is it would be roughly near 6% of GDP as Mr. Buffett suggested, or said more simply a lot lower than it is now. At any rate, the first step by the Fed and Government post 2008 was straight Keynes and the second step now is a Keynes derivative which is to use the threat of inflation to force corporates and individuals to put cash to work as the value of money is perishable. Except it is not exactly working like the fiscal and monetary authorities thought it would. All this “stuff” that is supposed to lower the discount rate in fact increases it the longer lived and costly a decision is. It scares CEOs. CEOs running real business (not experimental models) that live with decisions for a long time and pay for them when they are wrong cannot act frivolously. And even though they sitting on record levels of cash earning 0%, they are concerned about losing it or investing in a manner that will ultimately cause EPS to drop (bad hiring or capital investment decisions). And I do not blame CEOs one bit for having these concerns – they are actually very rational concerns given the state of our government and the global economic situation. If I were them I would be equally concerned about protecting cash flow for shareholders. And I wouldn’t want to go through again what I had to go through 2 or 3 times over the last 10 years alone. It is torturous and costly to reduce organizational capacity. In my opinion, the shorter lived an investment decision is and the lower its frictional cost or cost of exiting the mistake is, the more effective current Fed policy has been. Equities and credit and other highly liquid assets, investors play along because they are just renters and can exit whenever they want (although they never seem to exit at the right time). And speaking of renters, the second area where Fed policy has been effective is real estate which counter-intuitively is the next shortest duration asset (even though they are about the longest-lived). Real estate values are significantly influenced by interest rates which are locked in at the time of purchase. Oftentimes real estate is bought with other people’s money. And even though the assets themselves are long-lived, they can be sold, and importantly are almost always incorporated independently, so the investment risk is contained to the single project alone if it turns out poorly. For example, see the recent new investor activity in single family homes and farmland of all things, including equity hedge funds who apparently think homes are like stocks. Maybe it’s a sign that other asset categories (equities and credit) are getting toppy or inflation expectations are increasing when hedge funds begin to foray into the single family housing market and farmland (some having little or no prior experience in these markets). At any rate, it seems odd and not good to me when policy results in hedge funds buying single family homes and farms. It certainly raises price for the new natural buyer, and therefore lowers their disposable income. According to Mark Hanson “For Sale” vs. “Sold” spreads have blown out to record highs in certain markets. In San Mateo County the spread is $1.7 million, 150% greater than the average purchase price. In Santa Clara County the spread is $750k, or 80% greater than the average purchase price. In a normal environment at these price levels the spread is $100k to $200k. I also noticed the median price of a home in Washington D.C. reached its highest point in history in March. D.C.’s median sale price increased to $460,000 from $405,000 in March 2012, an increase of 13.6 percent year over year. Interesting the government sector which is a big part of the problem is flourishing while everyone else isn’t. Not a great incentive structure. And as an aside, unfortunately homebuyers have now been trained to think buying a home is a call option on society. The same goes for the guys who were/are running large financial institutions. The liquid segments of economy are acting like they believe rates will stay low forever. To me, investing on this basis is a recipe for disaster. One should always assume a normalized level of rates to value anything. Sorry Mr. Greenspan we have seen where valuing assets solely on the basis of current rates got us. If we should do that, baseball cards and chewing gum would also be great investments today. My suspicion is from here baseball cards and chewing gum will hold their value over time better than the typical company trading at 15x earnings derived from profit margins that are twice its average levels. And in point of fact according to the CPI the price of candy and chewing gum increased 31% between the years 2000-2012, while the S&P index including this year’s rip is only up 6% since 2000. Yes it matters what the price is that one pays for an asset! Interestingly Warren Buffett also stated that interest rates “act to stock prices like gravity acts on matter.” Now, interest rates are at generational lows and at least in theory have little to do but go up (while at the same time margins are at record highs). Here is the entirety of his thoughtful commentary from 1999 which includes his aforementioned thoughts on profit margins and interest rates, and his view that “the inescapable fact is that the value of an asset, whatever its character, cannot over the long term grow faster than its earnings do.” Unfortunately one of his concluding thoughts has not come to fruition: “Best of all, the rewards from this creation of wealth will have flowed through to Americans in general, who will be enjoying a far higher standard of living than they do today.” Even guys as smart and wise as Mr. Buffett can be wrong. Projecting rates this low sustainably into the future also means projecting no growth into the future which is not an exciting condition for the EPS growth which is needed for a broad market advance from these levels (note Mr. Buffet’s comments about an asset’s value not being able to grow faster than its earnings do). As an aside you never hear anyone tell you to sell equities because growth is accelerating and interest rates are starting to go up. The argument for using a normalized level of rates to value assets is the only one that remains internally consistent over the cycle. That is how businesses think when they make longer term investments. Anyway with respect to rates, in practice using a normalized view of rates to value assets unfortunately doesn’t happen and this is precisely why the Fed jawbones the notion “rates will stay low until 2015” to extend the threshold as long as they possibly can. I believe this cannot end well. It “helps” over the short term, but it ultimately destroys capital which gets poorly allocated in the feeding frenzy ZIRP causes. Back to CEOs running a business. I believe of all decisions (investing in liquid securities, investing in real estate, and investing in capacity and employees), investment in capacity and employees is the longest duration decision and the most expensive if wrong. Even though in theory employees can be terminated with relative ease, in practice there is a lot of friction and time involved. On a cash basis it is costly. Capacity is not cheap, not easily purged, and on a cash basis expensive to purge it (along with the cash losses along the way the excess capacity causes). Thus this is why Fed policy has worked with respect to increasing the values of liquid securities and real estate, and failed to date with respect to employment and capital investment. If one believes in rational expectations theory, CEOs in aggregate who are making long-dated decisions do not trust an economy that is powered by monetary amphetamines, nor do they have faith in our government. Business leaders by their collective in-actions have voted a resounding “No” on current monetary and government policy. As Abe Lincoln said “You can fool some of the people all of the time, and all of the people some of the time, but you cannot fool all of the people all of the time.” This latest massive and expensive effort by the government and Fed designed to encourage CEO’s to increase risk-taking has done the opposite and scared them into a shell or at a minimum just not worked. Whatever CEO’s are afraid of ZIRP, QE, building more roads and bridges and paying out more entitlements is not making them unafraid of those things. If the appetite for risk can be measured on a scale of 0-10, and it can go from a 10 to a 0, can’t this appetite also go “irrationally” negative? Isn’t that what CEO’s sitting on a record amount of cash in this environment are doing (losing money on a real basis)? Doesn’t this then also tell you that today’s risk aversion and the economy is of a different nature than it was in the past? Isn’t a crisis of belief about the only thing that could drive risk appetite amongst business leaders into negative territory for such a prolonged period no matter what the policy is that is thrown at them? And again, I think this “irrational” fear is actually perfectly rational for CEOs to have. As I look at the state of our government, and the global economic situation, it seems perfectly rational to be concerned about the sustainability of demand. As I said before, if I were them I would be concerned about protecting cash flow for shareholders. And I wouldn’t want to again go through what I had to go through 2 or 3 times over the last 10 years alone. And it may be this crisis of belief extends globally. The economy is much more global now than at any point in the past. By extension business leaders think of countries like they do customers. No CEO would rely on customers or suppliers with the balance sheets a lot of countries have. In the back of their minds they are wondering how exactly this all hangs together. Domestic fiscal and monetary policy cannot solve this problem, period. All the anti-technology sentiment all of the sudden is starting to remind me of Karl Marx. See the Financial Times article “Obama Must Face the Rise of the Robots” Does anyone ever think about all the jobs technology companies have created (new high growth companies, industries and products)? Work by both the US Fed and the OECD shows that more technology leads to more productivity and more employment, and as I said this is what they used to always claim until their policies started failing. As an aside, don’t whine about technology and at the same time put policy in place which runs up the value of high beta stocks the most (ergo a lot of technology companies), and often to un-naturally high levels giving them an even lower absolute and relative cost of capital and therefore the ability to develop even more technology. And with higher stock prices in general, that is more $ spent on stock buybacks to retire an equivalent amount of shares, which is less money to be invested in capital and labor. Simply if businesses were investing and growing, they certainly would be hiring all types of labor domestically, they wouldn’t even have much of a choice! This is the main issue, everything else is just a side-show or an excuse and not in the 80/20. This is also what is meant to naturally drive up the value of homes and other financial assets, as opposed to the other way around! There is more going on than a temporary lull in animal spirits that current fiscal and monetary policy will cure. If that was the case, it would be working already. And I know those in favor of these policies will retort by saying we have just not done enough. But if the nature of the economy and risk aversion is different, spend and ZIRP and QE all you want, it won’t help, and will just result in more imbalances, a larger deficit and a bigger tax on the future. I also suspect that if Keynes were brought back from the dead he would be skeptical of today’s monetary policy. He realized it cannot do everything and at some point it is akin to pushing on a string. And he might worry monetary policy has gone too far and is trying to do the job of fiscal policy and creating distortions in markets. I also wonder how he would think about today’s fiscal policy? Although directionally consistent with his thinking, he might also realize today’s economy is a lot different than the economy of the 1930’s. Regardless, no matter how well intentioned the current spending is, it will fail or even backfire if business leaders don’t trust it or believe in it. No amount of spending can overcome a lack of trust and belief. Trust and belief are central elements to a government working, an economy working, and a fiat currency having value. When trust and belief fail, the system will fail. And if the nature of risk aversion or the economy is somehow different than it was in the past, historical theoretical remedies will also fail. Circling back to the ~2003 profit cycle, there is a similar dynamic that occurred, yet it also had some very different dynamics as well. Similar to this current profit cycle, corporate profits vastly outpaced employment. The ~2003 cycle seems to have been a function of globalization and credit growth. Globalization led to blunt hiring in the US as cheaper labor was sourced abroad. Cheaper production helped US corporate margins. Similar to the ~2009 cycle, consumer revenue that normally would be lost due to tepid hiring and wage growth was replaced by credit. Then it came in the form of the US housing bubble and record consumer credit / home equity extraction. The important similarity to both profit cycles is that they were driven by credit growth that supported corporate revenues above what consumer income alone would have. In both cases corporate profits were the offsetting asset relative to the liability of government and consumer debt. The credit growth of 2003 proved itself not only un-sustainable, but tremendously costly. That loss of consumer credit has now been shifted to the government balance sheet and that of the US Federal Reserve. By definition, this also is unsustainable in some form. Sure it can continue to grow, but if it does at some point I believe it has to resolve itself painfully through higher rates or inflation, some other form of taxation or confiscation, or something else I can’t think of. Or a hunk of spending just has to stop. If I could tell you what, when, or how this is all going to happen, and what to do in the interim, I would be a billionaire tens of times over as opposed to writing stuff like this. Won’t it be interesting if going forward economic cycles are not marked by the supply of excess production capacity, but instead the supply of excess credit which creates asset bubbles as opposed to excess production capacity? I believe CEO’s have more rational expectations than certain classes of investors, namely the renters, who are a very big group collectively investing enormous amounts of capital. Thus policy causes a rice in price in certain asset classes (often as we have seen recently to irrational levels) more effectively than it stimulates investment by businesses in capital or labor. The costs and risks of monetary policy attempting to substitute for un-sound structural policy are much greater than the potential benefits! It just causes asset bubbles and does not drive employment. The cycle during the housing bubble was marked by tepid and disappointing employment gains. And this cycle, equity prices have ripped and housing prices have rebounded, and again employment growth has been very disappointing. I find the notion that QE and more QE and ZIRP and more ZIRP will cause CEOs to invest in capital or labor to be wishful thinking, especially at this point. Japan has already tried that. Japan like the U.S. has “excess” private savings including the corporate sector. Counter-intuitively Japanese gross fixed business investment over the last 10 years has averaged 13.7% of GDP versus the U.S. at 10.5% of GDP, yet Japan has still grown less quickly than the U.S. Monetary policy which doesn’t work perfectly to begin with cannot overcome structural, demographic, or political problems. Oftentimes monetary policy makes these issues worse for numerous reasons including causing capital misallocation and providing steroid boosts that enable politicians to ignore making the necessary structural change that needs to occur for an economy to become sustainably healthy. This may be the worst of all the negative side-effects of monetary policy. Hypocritically the Fed as part of its excuse making for the tepid response to its policy often cites the fiscal side of the house. But the Fed has been and continues to enable this problem. Lack of necessary structural change is what has happened in both the U.S. and Japan for a long time. Now the Japanese are resorting to outright debasement. I hope they are not a roadmap for U.S. and the rest of the world, but I am worried that is what is happening. And you could argue the U.S. is the roadmap they are following, and on it goes. From Caterpillar’s recent disappointing quarterly earnings report in the 2013 economic outlook section the following appears: “With interest rates at or near record lows in many countries, some central banks injected more funds (quantitative easing) into financial systems to promote lending and economic growth. With both Japan and the United States following aggressive quantitative easing policies, we expect other countries will eventually implement similar policies.” It is quite odd when statements like this work their way into quarterly earnings reports, and from the way it is written it appears they view this as a good thing. Maybe they are hopeful this all results in commodity price inflation, which they believe will be good for purchases of their equipment. Be careful what you wish for. But QE is generating neither growth nor currently not a lot of excess inflation as measured by the CPI (although between QE and ZIRP we do seem to have simultaneous inflation in certain asset prices and a lot of the costs the man on the street is experiencing and deflation in smaller portions of the average person’s basket). All the Fed does is with QE is create “excess” reserves, but they don’t put money in the pockets of the average consumer. QE cannot cause credit to be extended. Currently QE just equals excess reserves because demand is not increasing as policy is scaring business leaders and other investors therefore credit is not being extended (although there is now an enormous amount of dry powder). Also banks are potentially afraid to lend for the same reason potential borrowers are afraid to borrow. Additionally even though spreads might be decent, at these absolute very low levels of rates, it is risky to lend long against them at a fixed price for a long duration. And on top of it all the Fed is also paying banks to sit on these reserves. Excess reserves don’t benefit from a money multiplier. That is why they are “excess”. Creating an excess reserve is only excess because banks haven’t levered it. There is a difference between capital and money. Capital can be created when a business borrows at low rates and then turns around and invests. But in order to spark inflation, we need more money in circulation which is a proxy for wages and other prices. Credit extension is what puts money into circulation and moves prices higher on a broad basis. Ultimately either price will decline to meet wages or wages will rise to meet price. The huge risk to this is eventually the high-powered money may be put into use by banks (in addition to the leakage I describe in the previous paragraph which may not necessarily be well understood). If it does I suspect it will not happen in an orderly fashion. I am sure the Fed believes that if all the sudden this money starts to work its way into the economy and it begins to overheat they can remove money or credit at the exact appropriate time and rate such that excess inflation never happens. They probably also convince themselves this is the better problem to have. The same guys that get every forecast wrong, have missed at least 2 bubbles, and who have been flummoxed by QE and ZIRP not doing what they thought it would, think they can anticipate all the global knock-on effects of this policy action and also remove the stimulus at exactly the right time and rate and engineer a smooth landing? The average maturity for car loans to borrowers with blemished credit contained in asset-backed securities surpassed 70 months last year for the first time since at least 2005, according to Moody’s Investors Service, which uses General Motors Co.’s GM Financial as a bellwether for the segment. All loans longer than 72 months more than doubled to 14 percent as of April 20 from six percent in 2010, according to J.D. Power & Associates. The whole topic of QE is akin to particle physics, I am not sure anyone fully understands it. There are some that even make the argument QE is now becoming deflationary because it takes safe assets out of circulation, and that QE is now supporting short term rates as opposed to lowering them due to the ability to hold excess reserves at the Fed. I believe deficit spending is more akin to creating money that goes into the economy than QE has been. But tax and spend that is failing is counter-productive, it just takes equity away from business leaders and other investors who take better risk. The spend doesn’t help in an economy that is less manufacturing driven than it used to be and the fear is of a different nature than it used to be, perhaps now extending globally. QE is not resulting in credit extension or job creation for the same reason ZIRP and fiscal policy are not working. And these policies have not been working for a long time. When is there enough evidence that the problem is of a different nature and doing more of and different flavors of the same does not help? It only adds to the deficit and removes equity from the better risk-takers, creates more imbalances, and lets politicians off the hook from addressing structural problems. Related to the notion of capital allocation this latest batch of Fed policy has many market participants rooting for bad news so the monetary juice continues. Perverse incentives and capital misallocation are not good for the economy. In a capitalist economy the market is meant to determine asset valuations, not the Fed. Because these perverse incentives now exist, the U.S. market has rallied post the recent weak jobs report and some other soft economic data and numerous poor bell-weather earnings reports. The following snippet from a market pundit is typical: “…sometimes bad news, like the jobs report, is in fact good news. The fed gives you the game plan, and in the spirit of all good bets, follow the rules, and bet with the house.” Or Chuck Prince in 2007 “as long as the music is playing, you’ve got to get up and dance. We’re still dancing.” And this phenomenon is a global issue now. We have seen what has happened with Japanese equities, and we just had a 4% rally in EursoStoxx 600 in 3 trading sessions after the German PMI came in at a 6 month low of 48.8, French jobless claims hit a record high 3.22mm, and Spanish unemployment jumped 1% to a record high 22.7%, leading investors to anticipate more intervention in European economies. The Fed has adopted wealth effect driven policy for a long time, but it is only making people poorer. As I pointed out real median annual household income is 8% lower than it was in the year 2000. And it is not creating jobs. Monetary policy cannot accomplish what sound structural policy is meant to accomplish. The longer global markets are on monetary amphetamines, the less they do and the harder they are to get off. The only thing worse than stopping this (which will have consequences) is to continue doing it which will ultimately result in a larger problem. By way of analogy and not to belittle the severity of either event, 9/11 became an excuse to try to occupy two countries amongst other things. Now we are figuring out it didn’t turn out so well and was very costly. Similarly the financial crisis turned into an excuse for certain economists and politicians to uncork experiments and spend money like it is going out of style. Hopefully the latter turns out better than the former. But so far, both events have led to an enormous amount of wasteful and failed government expenditure and intervention which has ballooned our deficit and diminished our influence on the world stage. Schumpeter said exogenous events diminish risk taking in an economy. But these same events seem to be used as excuses to increase risk-taking amongst those running the show as they unfortunately have no real equity at stake. Generals want to fight, economists want to experiment, and politicians want to spend other people’s money. I guess they often just need an excuse. I understand that the upside of a government is that it can take risk when the private sector isn’t willing to do it, but is this the sort of stuff that is appropriate? Not all government risk taking is good or ends well. And when the government or Fed has no governor on its risk taking (equity or controls) by definition they will take a lot of bad risk. It is interesting that equity is meant to be such a great incentive and measure of performance for corporate executives, and we now understand unfettered risk-taking is a bad idea for financial institutions, but the concept of penalties for taking bad risk does not exist for the Fed or government officials. We have ended up with a system where the worst of the risk takers have the ability to take the most risk and are currently taking it at extreme levels. Back to Mills and Hayek, what has the US Federal Reserve (and other Central Banks) become? Aren’t they the “great” men or a “monopolistic government agency” independently solving problems that our imperfect system has been designed to avoid? And clearly they are without the enough of or even the “relevant information” as amongst other things they couldn’t even figure out there was a housing bubble when it was staring them in the face. The economy is now much more of a complex system and far less local than when Hayek argued a central bank can never have enough information or use it correctly. And sure there is a Fed mandate in place, and other theoretical supervisory mechanisms, but don’t kid yourself; the amount of leeway the Fed has is far beyond that of any institution in democratic America by orders of magnitude. Its ability to conduct its recent round of economic experiments is proof of this point. And by doing it to the degree it is, the Fed is acting as if it has 100% certainty it is correct when what they are directionally doing has a long history of ending badly. To be clear I am directionally ok with the Fed bailing out the financial system during the financial crisis, that would be commensurate with the role of being a lender of last resort. I am addressing their broader role and mandate and everything they have done post that point in time. When QE was instituted, the system was well beyond the point where it was going to melt down. One should have realized over the prior twenty years just how much leeway and power the Fed now has and how politicized it has become. Maybe even starting in 1960 when Nixon blamed Martin and tight credit conditions for his defeat, and then later appointed Burns is when the Fed and politicians may have started to become joined at the hip and the Fed began stretching its mandate. Coincidentally soon after, the methodology for calculating the CPI was revised several times and finally morphed to the point where it almost can’t show inflation, which gives the Fed effectively no controlling mandate. Interestingly since the Fed has become more interventionist with its policy, the depth and duration of recessions have declined versus the past. But at the same time, trendline GDP growth has been reduced by about 1%. GDP growth averaged 4% between 1930 and 1969 (which includes the Great Depression) and only 2.8% from 1970 until today. Nixon pulled the plug on the gold standard in 1971, part of the rationale being that a gold standard constricts the ability of the economy to grow as an economy’s productive capacity grows, so should its money supply. But since that has happened, somehow the economy has started growing less quickly? Look, the data is the data, whether what Nixon did with the gold standard was partly causal or not others can debate as you could certainly argue we were effectively off the gold standard for a long time prior to that. But regardless since 1970 successful attempts at smoothing the economy have resulted in less total output, fewer jobs, and giant structural problems. As an aside, I hate the canned response of “I will be dead in the long-run.” Yes you will be dead, but your kids won’t be. And often it’s not even about the next generation. Look at what is going on now due to poor short-term oriented policy. It’s not good math to trade two or three good years for five to ten sub-optimal years. Policy makers have been doing that and GDP growth has slowed over 1% and we have had two bursting bubbles the last of which has left us in uncharted territory and a position of great risk. Short term solutions seem to lead to bigger short to mid-term problems. Frighteningly many things going on today resemble what began to happen in the early 1970s under the Nixon administration that kicked off a period of stagflation. In both cases a new president inherited a recession and a war that he continued to fund, then feared another recession prior to re-election with a Fed providing cheap money and both entities doing everything they could to create jobs, and then increased social welfare spending (as Nixon did with Social Security in 1972). Now we don’t have price controls and an oil shock, but we do have global central bank aggressiveness on an unprecedented scale. Clearly in 1970 all the intervention completely backfired. Personally I am conflicted, now more than ever, as I see our political system flailing. But the dangers of great men making independent decisions have also been proven time and time again. What I cannot fathom ever working is when one segment of government (political/fiscal) is a dysfunctional “collective mediocrity” and what is really the other and equally important segment of government, the US Fed (monetary) is great men more or less doing whatever they want. And even worse, as I said before the Fed with its monetary steroids enables the “collective mediocrity” to ignore making necessary structural change. With each segment being co-dependent on the other, how can that sort of system can ever work in the end? It’s like having a car with the pistons pushing in the opposite direction and running on flat tires. My suspicion is if the great men weren’t there in the first place (or had a much reduced role or were operating under the restrictions of real data), we wouldn’t have had nearly the problems we did over the last ~15 years or even the inflation problem of the 70s to the degree it occurred. This is an interesting old interview with Milton Friedman, pay attention to what he says starting in about minute 1:10 with respect to free markets and political appointees: “the record of history is absolutely crystal clear that there is no alternative way so far discovered of improving the lot of the ordinary people that can hold a candle to the productive activities that are unleashed by a free enterprise system….is it really true that political self-interest is nobler somehow than economic self-interest….just tell me where in the world do you find these angels that will organize society for us?” Seems like a blend of Adam Smith and JS Mills notion of “great men.” The entirety of the brief interview is insightful, none of it having much to do with his view on money. It would be interesting if the American public were able to vote on Fed policy. Both sides argue their views in several very public debates, and the population votes. My strong suspicion is ex those in the financial industry, the vote would be a resounding no. And it would be by a larger margin than by what the current president was elected with. So is the Fed having all this power and leeway a good structure? Maybe. Democratic? Certainly not. And to be clear, I am not arguing the Fed should be politicized or even become a democracy. I do think part of the problem is it has become politicized. But I am arguing there needs to be a stricter limit on what the Fed’s powers are and how they are measured as the current governance mechanism (the mandate alone) and measurement system (the CPI and employment) has given them too much leeway. If I were to argue the US Fed was now more influential than the rest of our government (all three branches combined), you might disagree with me, but you could not prove that argument incorrect. And if I were to argue Ben Bernanke is the most powerful man in the world, same thing. The President might control the military, but money and the economy might be the new military. And Bernanke has already started setting off monetary bombs without something like the War Powers Resolution of 1973 to check this power, and the rest of the world is responding in kind. This used to be referred to as Mutually Assured Destruction. Is this how it is supposed to be that the US Fed has become this powerful and influential? This is an issue people ought to spend more time thinking about, and it might be one of the most important ones facing our country. Clearly the government needs to function better as well, but that issue is at least getting attention, although not yet resulting in any meaningful change. The Fed cannot adopt a role of trying to correct for poor structural policy, especially when the Fed’s only real policy tool is to try to drive up asset prices. This is the downside of the employment component of the Fed’s dual mandate and its current un-governed interpretation. All this is resulting in distorted markets, poor capital allocation decisions, a poorer population in real terms, larger and larger imbalances in the system that ultimately need to resolve, and a declining rate of growth in GDP and perennial underemployment. How is it possible to check the powers of the Fed in an effective and productive fashion? I believe it’s via its own mandate and specifically altering how inflation is measured if employment is included in the mandate. Also there could be a change to the way the Fed president and governors are nominated. Others (a small and quiet minority) have argued to significantly curtail the Fed’s powers to being a lender of last resort. Without arguing specific policy points, something needs to be done to rein in the power and degrees of freedom the Fed currently has. The most influential economists and thinkers in the world are not spending time figuring out how good an aggregate measure of price the CPI as currently constituted is, and how reasonably it is being interpreted by the Fed as part of its mandate or even how reasonable that mandate is. It’s not a terribly exciting topic (it’s crunching a lot of numbers), it’s not a way to endear yourself to a peer group many want to advance within, and it limits the ultimate powers of that peer group (probably a big reason the CPI has become what it has become). Those who do spend time on this issue seemingly just find ways for inflation measures to show less inflation. Who has ever tried to cut back their own role in the world? Importantly all the entitlements are tied to the CPI, so the government has another incentive to keep the CPI as low as possible. It is a poor solution for solving the problem with entitlements. If it weren’t for the ability to lie with statistics, maybe we would be forced to come up with a real and sustainable solution to this problem? But if that is how the powers that be want to partly solve for the problem, they should use the tortured CPI number for entitlements and a more realistic set of numbers for governing the behavior of the Fed and implicitly the US government. There is a powerful incentive structure in place for the CPI to understate real inflation. And since the governance method for the Fed I have suggested is better measures of inflation and a change in how they are appointed, I will address that issue. And for the following to make sense, one must also be familiar with the concepts of hedonics, substitution and owners’ equivalent rent. I won’t explain what they are, but I will address what I think is wrong with them. But first, with respect to how Fed officials are appointed, no target or constraint will make a bad banker a good banker. It comes down to the people doing the job. But we may have developed a self-reinforcing culture of politicized short-term focused, single-minded, confirmation biased central bankers due a flawed appointment system. Due to human nature and confirmation bias, they push or pull facsimiles of themselves through the ranks and therefore become a like-minded group. For example as Greenspan transitioned to Bernanke, Bernanke will probably transition to Yellen, and she is cut from the same cloth. Three in a row doing the same thing that isn’t working, and in higher doses – what Albert Einstein referred to as the definition of insanity. It’s the same issue with many of the Governors as well. Look who is running the NY Fed for example and where he formerly worked, and how different are the folks running the Chicago, Boston, NY and San Fran Fed’s from each other and Bernanke? The twelve members of the FOMC average 57 years of age with a standard deviation of only 4.5 years. The three members of the President’s Council of Economic Advisors average almost the same 56 years of age with a standard deviation of only 2.6 years. All PhDs, and a big overlap in academic institutions. Talk about a tightly grouped bunch. Now this does not guarantee they all think the same way (come from same school of thought), and self-selected themselves, but it sure increases the chances. Per my point, as controversial as current Fed policy is, and despite any pretense of vigorous internal debate, there is only one active dissenter of the twelve on the FOMC. And if confirmation bias is bad for investors, how can it be good for the guys running the economy? The economists involved in setting policy today ought to spend more time talking to CEO’s and doing their own shopping and less time talking to each other and doing differential equations. “For the economics profession that came out of the [second world] war, the Federal Reserve was not a very important place as far as they were concerned, and their views on monetary policy were not framed by a working relationship with the Federal Reserve. So I would date it to maybe the mid-1970s,” says University of Texas economics professor — and Fed critic — James Galbraith. “The generation that I grew up under, which included both Milton Friedman on the right and Jim Tobin on the left, were independent of the Fed. They sent students to the Fed and they influenced the Fed, but there wasn’t a culture of consulting, and it wasn’t the same vast network of professional economists working there.” But by 1993, when former Fed Chairman Greenspan provided the House banking committee with a breakdown of the number of economists on contract or employed by the Fed, he reported that 189 worked for the board itself and another 171 for the various regional banks. Adding in statisticians, support staff and “officers” — who are generally also economists — the total number came to 730. And then there were the contracts. Over a three-year period ending in October 1994, the Fed awarded 305 contracts to 209 professors worth a total of $3 million. Affiliations with the Fed have become the oxygen of academic life for monetary economists. “It’s very important, if you are tenure track and don’t have tenure, to show that you are valued by the Federal Reserve,” says Jane D’Arista, a Fed critic and an economist with the Political Economy Research Institute at the University of Massachusetts, Amherst. It could be interesting to alter the way Fed Governors and Chairs are chosen. The seven appointees to the Board of Governors are all nominated by the President and confirmed by the Senate. This makes seven of the twelve on the FOMC Presidential appointees. They have fourteen-year terms which are designed to avoid political influence. However the Fed Chairman and Vice-Chairman only have four-year terms in those roles and need to get re-appointed by the President (they still have a guaranteed fourteen years as Governors). Given the Fed Chairmen need the President’s approval to keep their jobs as Chair, it’s a reason to make the President happy. So what is meant not to be political ends up being political, or at least self-serving. Greenspan somehow ended up hanging on for 20 years and visited the White House more often than any other previous Fed official. Instead it could be interesting to have the then minority party (with a minimum threshold of % of seats so they are not a super-minority) nominate the Chairmen and Governors as their terms come up. And allow a maximum six-year term for any Fed Chair (still allowing for fourteen years as a Governor). Since they are very powerful, but not elected, it seems they should serve for less time than the actual President can. And six years is longer than many actual Presidents do serve. Granted the Supreme Court is different, but for a different reason, and no one Supreme Court member is as differentially powerful as the Fed Chair is. Hopefully this process would result in a more mixed and less self-perpetuating group. And for those who say this will put a Fed Chair in charge who will act counter to the goals of the actual President, well I thought the Fed wasn’t supposed to be political to begin with, right? And aren’t checks and balances supposed to exist? Or maybe simply just eliminate the role of the Fed Chairs entirely, resulting in a more consensus driven process. Or require the standard deviation in age range is seven or nine instead of three or five (this hard to do but you get the point). And some say even more simply just return the Fed to its original and primary role as the lender of last resort. No system will work optimally if everyone thinks the same way, anchoring and confirmation bias will just take over. If there are twelve people in a room, and they all think the same way, you might as well just have one. As CEO if one pursues a strategy and it doesn’t work, you change it, or lose your job. In investing, if you make a bad investment, you sell it. In life, if you are in a bad relationship, you change your behavior, or end it. But apparently in economics, if a policy isn’t working, you sit in a room and agree with each other that it is great and do more of it and get promoted through the system? There are certainly issues with my proposed solutions. At least term limits for politicians are being discussed. The same discussion should be had with respect to how members of the Fed are appointed as well. Searching on Google I could not find one reference to an alternate methodology. That shows how little thinking has been done on this issue. I believe the current system we have in place is self-perpetuating and politicized and broken. On a related point many Americans vote for the President on the basis of who they believe they will appoint to the Supreme Court if a seat is vacated. The Fed Governorships which are of equal importance do not have that degree of influence from the people, probably because people do not understand the issue. And regardless of how Fed officials are appointed, human frailty being what it is, they do need to be constrained by limits. So on the subject of limits, let’s start with hedonics and substitution. It seems hedonic quality adjustments only go one way – down. The average American weighs 35 more pounds than we did in 1969. It’s because cheaper calories are really bad for you. Not to mention that like for like the quality of the meat and produce is lower than it used to be (measure-ably fewer nutrients, more chemicals). Our cheap food now results in a huge incremental healthcare cost in the future (which has become now), both in terms of units per individual and more volume of those needing the units of care. The price of food is not hedonically adjusted up to adjust for its lower quality and significantly higher lifecycle cost. But somehow men’s shirts are hedonically adjusted. Huh? List of adjustments here. And although my computer might cost more, it also gets hedonically cheaper even though I can’t type any faster or coherently so in practice I am not one bit more productive with it. With respect to substitution, if one substitutes horse for beef because beef is too expensive, by definition the horse is of lower quality because one prefers beef. So shouldn’t there be a hedonic adjustment back up for the price of horse that is exactly equal to its price differential from beef? It seems hedonics and substitution should mathematically always cancel each other out – the notion of substitution should not exist if hedonics exists. Regardless if the price of beef changes, I want to know it changed. But with substitution in place, the meat category will have decreased in price as opposed to having gone up in price like it did in the real world. With respect to owners’ equivalent rent it is an obvious policy goal to increase home prices, but then we have a measure that may not show this increase in prices. Odd. It is also based on survey data as opposed to actual rents. From the BLS website: The expenditure weight in the CPI market basket for Owners’ equivalent rent of primary residence (OER) is based on the following question that the Consumer Expenditure Survey asks of consumers who own their primary residence: “If someone were to rent your home today, how much do you think it would rent for monthly, unfurnished and without utilities?” And this survey data is also a whopping 30% of the core CPI basket (4x as large as the next component), so if it doesn’t budge, it overwhelms the movements in price of everything else. So rates can be dropped, the price of everything else goes up, housing prices go up a lot, owners’ equivalent rent barely goes up, and the CPI really understates the changes in prices that are occurring for everything else in the economy. This is what happened with OER between 2000 and 2008 (and from ~1977-~1982). And to be fair the use of owners’ equivalent rent can also result in the opposite problem. But when it’s gone up faster than housing prices, it’s only been to a very small degree. Used as the only measure of housing prices, it can be very problematic. And we are at a point in the cycle again where housing prices are going up, the prices of other things are going up, and owners’ equivalent rent is going up much less quickly. Then with respect to the notion of the CPI ex food and energy, the Fed itself has claimed it does not influence all prices at all times. For example the notion of CPI ex food and energy which started during the oil crisis was a function of the Fed claiming they had no control over food and energy prices at that point in time. Although Fed policy likely did not heavily influence food and energy prices during the oil crisis, now it is probably highly influential. In fact if the Fed is suggesting their policy is increasing asset prices (they have as Bernanke himself cited the increase in the equity market as justification of the success of QE) and increasing aggregate demand (which is why they claim to be doing it as demand = employment), and an increase in demand (along with an increase in asset prices) will by definition increase the price of commodities, how can they conclude they are not influencing the price of food and energy and exclude it from the measure they use to govern themselves? In the case I describe food and energy are really no different than the price of labor or anything else they would admit they influence the prices of at a minimum due to the impact of growth on those prices. Seems disingenuous at best to me to currently exclude food and energy from the prices the Fed is influencing. Net/net the CPI is full of subjectivity: measurement, substitution, hedonics, composition of the basket, owners’ equivalent rent, ex food and energy – after all the data torturing it goes through it should really be called the CPI ex ex ex ex. It is also static in its composition (except when it starts to show inflation then the methodology is changed) and sometimes additionally flawed as a measure of the Fed’s influence on prices, especially with respect to the notion of ex food and energy. The best case for the CPI is that it is a best guess. It is impossible for it to be exactly right. Tying a very important mandate to what best case is a best guess is problematic. The Reserve Bank of Australia’s approach is to look at all measures, and they manage it over a cycle. If something is a persistent source of inflation, they’re still under an obligation to tighten to offset it (target average inflation range of 2%-3%). Still imperfect as it sounds like a recipe for looseness, but better. It gives them discretion to be sensible. The RBA started tightening by late 2009, lifting their cash rate target from 3% to 4.75%, in part because their CPI actually can and did show inflation above target levels. They’ve since eased again back to 3%. But it’s far from ZIRP and they have tightened and loosened to reasonable levels while we have only stayed at ZIRP. This is their methodology. The British completely exclude housing prices from their CPI. Again not perfect, but at least they don’t have 30% of their CPI not budging and masking the degree change in price of everything else. If there was a simple answer everyone would do it the same way. They are all smart people. But almost every country does it differently. The baskets are vastly different and so are the methods of measuring price. So there is a good chance our method is just not right. And it certainly does not resonate with what the average consumer has been feeling. As a reality test, how about a simpler basket comprised of actual home prices, college tuition (which by itself is interesting because a lot of cost factors are embedded in college tuition including labor), food (maybe just the prices of a Big Mac which are up 5.2% per year since the end of the recession and labor is also part of the price of a Big Mac) and energy (gas) and health insurance prices (includes labor). Look at how these actual prices have changed and then tell me whether or not there is inflation. Is it a perfect measure? Probably not. An interesting reality test and point of compare? You bet! And it is probably a fair bit closer to what the average consumer seems to be feeling now. This basket also would have set off giant red flags about Fed and Government policy long before the financial crisis reared its ugly head in 2008. So another solve is to develop several metrics that the Fed is held accountable to and is forced to tighten if any single one of them gets out of whack. In addition to what we have now and working within the constraints of the current system, for starters I would like to see a CPI ex owners’ equivalent rent and ex hedonics and substitution, done both with and without food and energy. If those series were run starting 20 years ago, I wonder what the cumulative difference in prices would be that they would show versus the current CPIs? I suspect others could suggest different relevant measures and components, maybe even referring to some of the older methodologies as points of reference. With respect to my prior points where I am trying to be provocative, by definition if the CPI is not a correct measure of the change in price the average person is experiencing, then there is an issue with respect to the Fed mandate. Is it possible the inflation that the average person has experienced over recent economic cycles is higher than what the CPI ex food and energy or just even the CPI implied? If so, even by only 1% or 2%, what would the implications have been? First of all at a minimum less power for economists and the Fed and a higher cost of entitlements, which is one reason why nearly every “great” man will dismiss this point out of hand and call me a crackpot for even thinking it might be true. More importantly, I believe at many points over the last 20 or so years we would have had different monetary policy from the Fed and likely different fiscal policy from the government which would have put us on a better path where underlying structural changes were actually made by politicians, and we would have avoided two costly global asset bubbles and the damage their bursting caused. Nonetheless it is interesting that those governed by the number including the politicians via their linkage to the Fed directly and through the economy also seem to indirectly control the number itself. Therefore how it is calculated has been changed at interesting times in the past. And every change somehow coincidentally has lowered the reported rate of inflation, and seems to have occurred at important policy making (fiscal or monetary) junctures. Not much of a separation between Church and State. Speaking of which, the former Commissioner of the Bureau of Labor Statistics which produces the CPI (Katharine Abraham) is now one of the three members of the President’s Council of Economic Advisors. Per my point, now politicians are contemplating a potential move to the chained CPI (lower again) to calculate certain federal benefits. This may be an “elegant” way of cutting unsustainable entitlements, but it also makes my point about every new inflation measure showing less inflation. And I am not the only one to think along these lines, see “Haute Con Job” by Bill Gross, his PIMCO investment outlook dated October 2004. It is good reading. I know it sounds nuts to talk about a faulty CPI and the role of the Fed. But Bill Gross is a pretty credible and important guy, and in his piece he says more or less the same thing as I did, with more data, and more articulately. According to Bill Gross substitution and hedonics alone wipe out an additional 1% or more of real inflation (notwithstanding issues with food & energy and owners’ equivalent rent that he does not address). And it’s become a much bigger issue since 2004 when he wrote this piece. If Bill Gross is right that inflation is understated, at many points over the last 20 or so years we would have had a higher reported rate of inflation and therefore different monetary policy from the Fed and likely different fiscal policy from the government which would have put the global economy on a better and more sustainable path. Another way of thinking about this, current inflation measured using the pre-1980 methodology would be about 10%, and using the pre-1990 methodology would be about 6%. Therefore by deduction if the current methodology for the CPI was in place in 1970, there would not have been a disastrous inflation problem according the CPI at least. Interesting because there is no doubt there was a lot of inflation in the 1970s. And I am not claiming the CPI as it was calculated then is right. However, what is clear is that when the Fed’s dual mandate was put in place, the CPI then gave the Fed much fewer degrees of freedom than it has now. If thinking about the CPI has evolved, so should thinking about the mandate and how much flexibility the new CPI should give the Fed. By analogy, when the 2nd amendment was put in place, machine guns did not exist. If thinking had not evolved since then, everyone would be allowed to walk around with a machine gun and buy it with no license and no background check. I don’t buy the argument that the US Bond market trading where it is means there is no inflation and no prospect of inflation. First of all it is no longer clear to me the bond market is even a market anymore. And without going into detail, there are more factors affecting the prices of our debt than just a view of inflation, such as our exorbitant privilege amongst other things. Also we know markets have been badly wrong. It would be a fascinating experiment to find out what would happen to bond prices if our CPI was printing 1% or 2% higher numbers with the exact same underlying change in price occurring? I have no idea if the psychological influence would overwhelm what should be the real influence, or if it would even matter in the face of what is going on in today’s market. Switching gears, when Bernanke talks about the Fed having kept inflation under control for the last 20 years, he is taking an enormous amount of creative liberty. Globalization and technology (formerly known as capitalism and free markets and competition and innovation) is what has kept inflation under control. Not all deflation is bad – lower prices driven by innovation and productivity is good. And if productivity is driving the prices of certain things down, it should not result in the Fed trying to drive the prices of everything else up (real estate, equities, etc.). With all the talk about QE and inflation, from an economics 101 perspective even disregarding Fed policy and inflation measurement, I still cannot see how we are not between a rock and a hard place. Lost in the inflation question which seems to now center on ZIRP and QE is the question of productivity. Simplistically for a few reasons I do think it will be tough for productivity to increase at rates it did over the last 20 years. Unless a new internet is invented and there is another planet with low cost labor that joins the global supply chain, there is going to be a problem. Although in theory, at some point a new internet probably will be invented, it is probably not happening in next five to ten years or maybe even twenty. Here is some data. US non-financial sector productivity growth rose in the twelve months ending Q3 last year by just 0.4%. For 2012 it is likely to have been lower because non-farm productivity just released fell 1.9% q/q annualized in Q4. Therefore a 4.6% q/q annualized rise in unit labor costs in Q4 (up 2.2% y/y). By comparison non-financial sector productivity averaged 2.5% pa from 2000 to Q3 2008 and 2.4% per annum in the 1990’s. Non-farm productivity grew just 0.6% last year compared with 2.2% per annum in the 2000 – Q3 2008 period and 2.1% the previous ten years. Despite the high unemployment rate, we are not getting productivity, and growth is seemingly more nominal than real. Coincidentally, inflation expectations, as measured by the 5 year breakeven yield, are right at the top of the post-2008 range at ~2.4%. If this all sounds nuts, then tell me why the average American seems to not feel so good, dis-satisfaction with the government is running at an all-time high, and casual dining establishments (a good measure of disposable income for the average consumer) are now seeing sales down 5.4% Y-Y as of last month. I find it interesting that policy which on the surface is seemingly designed to redistribute wealth is apparently doing the opposite for the time being. Wrapping things up I believe if there is growth there will have to be an inflation problem. Malthus may finally be right. The world does seem to finally be short of natural resources. At the same time even nations who have been a source of low cost labor are seeing their wage rates go up, and less relative production is being shifted to them. And productivity growth has slowed. On top of these underlying factors that would normally pose significant inflation risk, there is an enormous amount of competitive easing going on by central banks around the world. Apparently inflation is the problem they seek to have. If there is growth and credit extension they will certainly get it, and likely in spades. And the other side of the coin is there is some chance we may never get the growth (especially in real terms) as real income does not seem to be cooperating, and some significant mis-allocations of capital and imbalances are also emerging in the process, and that often comes undone with unforeseen consequences as well. Then there is the problem with entitlements. This is an issue that people are at least thinking about. Here is another interesting article. And this from a guy who has done pretty well for himself. And I worry our country is wrestling with the 6 issues described in the book Immoderate Greatness by William Ophuls to varying degrees. Although one or two of these issues may be manageable, all 6 are not. I have indirectly touched on some of these themes. It may simply be that what is described in this book is the root cause of many of the issues I raise, or even simpler it’s just hubris, overconfidence and a sense of entitlement that has become rooted in our leadership (they seem to play more golf in 1 year then I did in 15) and too much of the population across all segments (this includes the wealthy and very wealthy and business leaders as well). Although I have let business leaders off the hook, they have been far from perfect as well. For example, they need to realize the government potentially eliminating tax loopholes such as those that exist for foreign earned income and IP transfers amongst numerous others does not make the government communists, it just makes it more effective. I agree with Mr. Buffett on the point of corporate taxes, although I may get there a different way (loopholes versus rates). Rational tax policy encourages rational behavior. Re-capturing tax income here are dollars that don’t have to come from a more harmful and less rational place. And a fair bit of jobs reside overseas due to the ability to take advantage of loopholes and these jobs would come back to the U.S. if these loopholes were eliminated. There are other issues of entitlement CEOs need to get over as well including the amount of compensation they earn and how it is measured and awarded. Anyway the book is a great read and it is only 70 pages (with about 40 additional pages of footnotes he draws on an amazing amount of content). It is scary how much of what he describes is going on in America today, especially starting in his 4th chapter “Excessive Complexity.” I don’t think his intent was to describe America therefore it is even scarier how much of what he describes mirrors what is going on here now. Particularly interesting to me is Ophul’s description of inflation which begins on the bottom of page 59. He notes that this process often starts with the notion of attempting to create a little bit of inflation to “grease the wheels of commerce and foster economic growth.” He concludes that “this process is “always suicidal in the long-run” and “those who control the policy…are convinced that they are in control of events….the delusion of control is revealed to be what it was all along: hubris.” He also offers “a deliberate policy of inflation is tantamount to and abdication of responsibility and an omission of failure on the part of the governing class. It demonstrates they have allowed the society’s problems to become intractable and lack the competence or the integrity to deal with them….I does not solve the problems of society; it aggravates them and leads inexorably on toward self-destruction.” His manner of describing what leads to this state and how it resolves is fascinating and I have not done it justice. The book is a must-read. At least it sounds warning bells. He more or less concludes that there is not much hope as society will fail to recognize its problems and will not have the courage or will to act. I keep trying to tell myself it will all be fine in the end, because it always seems to be fine in the end. But what if the American spirit just isn’t what it used to be? I hope that is not the case, because of all things that is the one that matters the most! I guess 20 to 50 years from now we will know. My writing probably makes me sound more extreme than I am in practice. Part of what I am trying to do is to be provocative. Not all Keynesian ideas are bad, many are good. Keynes is also largely misinterpreted as he advocated building up a surplus in good times, but the big problem is this never seems to happen as programs meant to go away end up sticking. Often austerity is not good, especially in an inter-linked global economy. Not all debt is bad, credit is necessary for an economy to thrive. Certain social safety nets are necessary and a big positive. With all these things it is a question of what, how much, and for how long. Not all economists are short-term oriented and want to run experiments on the economy. And not all economists think the Fed should have the flexibility it does, and that government policy should be what it currently is. The world is a complex place right now. But short term solutions will only make the problem worse, and short term solutions are part of what have caused the current problem. Unfortunately as extreme as I may sound, the system itself is also on the other extreme. There has to be a happy middle ground somewhere. The majority of economists in the Fed and surrounding the President are ~55 year old PhDs of the same cohort largely locked into a singular framework (I already presented the data). The younger economists with a smaller sphere of influence are closer to that middle ground, but they are not in the power groups. Some of the younger guys may be our best hope as they have the advantage of observing what is going wrong from the outside and are not psychologically locked into policy they have put in place. And the older guys on the other side of the coin are being completely ignored, even though they have incredibly valuable things to say as well. Paul Volcker resigned as chairman of Obama’s economic advisory panel, I suspect because nobody was listening to a thing he said. Maybe not entirely fair to segment it by age, but you get my point. There are a group of like-minded pump and spend and interventionally biased economists on the Federal Reserve and advising the President on economic policy that are pretty far out on one guardrail. Plus I get the sense that with a fair bit of these guys, they have no credibility amongst their peers unless they talk about something that is so complicated, nobody else with an IQ below 150 can understand it. Part of the reason is because in the field of economics, a lot has already been done and it is hard to be differential. And fair enough, there may be decent insight in this type of theory. And I understand the world is a tremendously complex place right now. But on the other hand, I feel like so much of this analysis is focused on the 20% and not the 80%. The basic concepts underlying capitalism remain simple. No amount of hypothesizing or modeling will ever explain or super-cede basic economic principles and those of human nature, regardless of how many formulas it takes to communicate them and how elegantly they are worded. Economics is actually closer to art and religion than it is science. With respect to the politicians, things seem so dysfunctional now, that even the easiest of issues cannot be solved (and hypocritically the Fed continues to enable this problem even as they use it as an excuse for poor policy traction). Both Democrats and Republicans seem to agree the tax code needs to simplified and loopholes eliminated (especially corporate foreign earned income). But they can’t even get to a solution on that issue, which is simple relative to everything else. Or even simpler, the Littoral Combat Ship is by every account a complete disaster. And for a government already spending too much, they can’t even find a way to stop that program. So whatever we are doing now, it ain’t working. One does not have to be a genius to figure that out. And it’s the American way – we should be seeking to do things better and differently all the time – and not just in the world of business. The equity market is not an arbiter of what a healthy economy is (and I have already talked about why the equity market is where it is), nor is the fact that we seem to be doing better than Europe or Japan – both of these arguments are the equivalent of being the world’s tallest midget (no disrespect to short people I am vertically challenged as well if you hadn’t already figured that out from my writing). In fact since November 2010 the Shanghai composite is down about 35% while the S&P is up 30%. Whose economic situation would you rather be in? At least the Chinese have a ten year plan! I wish I could be more prescriptive and offer more solutions for the problems. But in order to solve a problem, you must first realize you have one. With respect to the Fed, I don’t think the U.S. realizes it has a problem, so that is why I picked on that issue, and did my best to provide potential solutions (granted without suggesting specific policy solutions because if I did this would be 4x as long). With respect to the Government I know that issue is at least getting some attention, although on the question of action and real change, there has not been much to date. In summary with respect to the overall economy, it seems there is a revenue problem (government debt seemingly cannot continue to grow at this rate with no consequences) and an expense problem (lack of innovation and productivity growth and a potential shortfall of natural resources). On top of it all there is an enormous amount of economic experimentation by central bankers globally, and governments that seem unusually dysfunctional at best. With no comment on timing, how it ends well is beyond me. But I hope I am wrong, and I have certainly been wrong before. Potential good endings could be: productive deployment of the excess savings in China, but that will take a long time and also will hurt the cost side; a huge and unexpected innovation especially one on the energy front; the politicians get their act in gear and they and the central bankers adopt new frameworks and focus on longer term solutions as opposed to short term steroid injections; the situations in other countries slowly begin to resolve; or oddly somehow it all works out in the end as little sense as it seems to make, the American spirit somehow prevails at the end of the day. My best guess is that however it does end up resolving, it will be in a manner that very few are predicting. And to be clear in no way is this a prediction for the stock market as this all sorts itself out; I have no idea. From here I wouldn’t be surprised by up (especially in nominal terms), and I wouldn’t be surprised by down. Just remember, the stock market going up primarily for inflationary reasons is not a positive outcome. Again, if I knew how all this was going to resolve, and when, I wouldn’t be writing this!